It was France's "dirty war", an unpopular struggle in Vietnam against the French authority governing the colonies of French Indochina. The eight-year First Indochina War ended in 1954 with the historic battle of Dien Bien Phu, a fight that some historians say marks one of the first times a colonial independence movement managed to grow from resistance fighters to organized army, rising up to defeat a major world power. And now that battle has sparked another historic moment: The first major video game created in Vietnam for a worldwide audience. Think of it as Vietnam's Call of Duty. In 7554 players will take on the role of a member of the Viet Minh communist revolutionaries in their battle against the French Union's French Far East Expeditionary Corps. The name of the $12 PC game comes from the day the French army surrendered to the Vietnam People's Army, May 7, 1954, Huy Nguyen Tuan, director of developer Emobi Games, tells Kotaku. "We wanted to create a game worthy of the current generation," Tuan said. "At this time, no one in our country has created a current generation title. It was a little bit daunting and also very exciting to be breaking new ground. And when we decide to do it, we choose context that we are proud of. We set out to create a game that pays homage to those who stood up and protected our country. 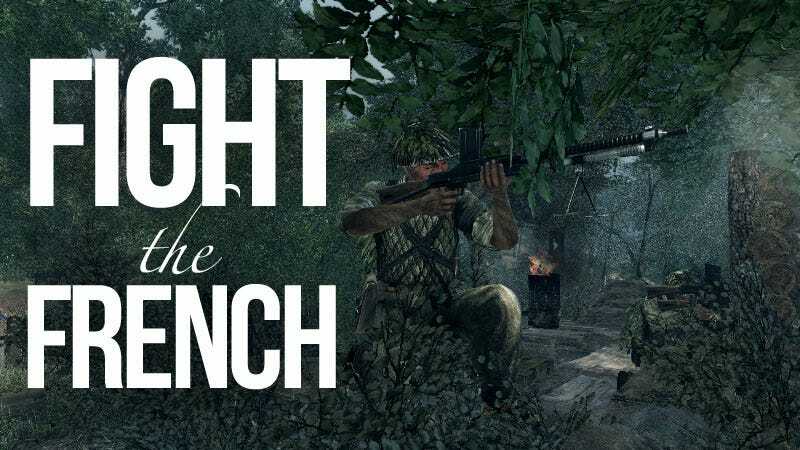 We wanted to a game about one of our greatest battles, 'Die Bien Phu.'" It's a historically interesting battle, pitting players against the better-organized, more technologically-advanced French military. The French wanted to draw the Vietnam People's Army into a major battle in the hills of northwestern Vietnam that would cripple them. But instead the army, which had recently acquired heavy artillery, surrounded and besieged the French. Players will end up spending more than half of the game in this battle, Huy told me. "As a gamer, we wanted a variety of environments that provided backdrops for different gameplay features and missions," he said. "As a story teller, we picked parts that fit within the timeline and helped tell a story. As a developer, we picked parts we thought that we would like to play." While it was a historic moment for Vietnam, I asked Huy if he thought the game and its topic would be as approachable to a western audience who may not be familiar with the history of the First Indochina War. "I don't think that is problem," he said. "For instance, Normandy and D-Day are not familiar battles with Vietnamese people, but we really love to play Call of Duty. It's a good game that is fun and challenging to play. We believe that gamers are accepting of other races, religions and beliefs that are not their own. We set out to make a game that gamers will enjoy playing." The First Indochina War remains controversial for some, both in France and abroad. It was a war fought over decolonization, one that eventually drew the attention and support of both the U.S. and U.S.S.R. But Huy said he doesn't plan to get into all of the aspects of the war and the deeper involvement of outside governments. Instead the developers wanted to create a story "about soldiers who leave their homes and families to fight for their country." Despite its topic, he thinks the game, set for a Dec. 16 release in Vietnam and Feb. release in North America, is one that anyone can enjoy. "I remember I saw a film titled Dien Bien Phu by a French director," he said. "That inspired us to make the game. We worked with some friends who happen to be French and they helped us build the game. We didn't set out to create a politically touchy game with the French or anyone else. We set out to create a game that we can be proud of. It is similar to the first Call of Duty: A fun game set in a historical backdrop. We hope that fans of FPS and military shooters around the world will give 7554 a chance.